Bringing horsemanship up-to-date with positive, reward-based methods, the truly kind and humane approach to working with horses that Kathie teaches will provide huge benefits for you and your horse. 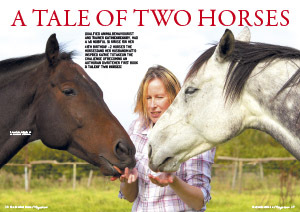 Following two ex-racehorses over the course of a year, as they go from being reactive and unable to be handled, to calm, well balanced, contented equines, you’ll get to know the personalities of Charlie and Star, as they make the transition from racing to home environment. Have the happy, stress-free relationship with your horse you’ve always wanted! Two horses with behavioural problems embark on a rehabilitation programme using only positive, reward-based methods, developing into self-confident, well-balanced horses. Woven throughout is the story of their owner’s life on a rural farm, and insights into her work with dogs, cats and other species as an animal behaviourist. Bringing horsemanship up-to-date with positive, reward-based methods, the truly kind and humane approach to working with horses that Kathie teaches will provide huge benefits for you and your horse. This book provides an understanding of behaviour and learning theory, along with free-will, hands-off, and non-coercive techniques, and shows how to apply these principles for stress-free training. You’ll learn how to prevent small issues becoming big problems, making battling with your horse a thing of the past. Easy to read, this book can be used as a complete start-from-scratch guide, or to browse through, selecting those parts that you wish to work on to achieve fantastic results: reliable behaviour, stress-free, happy and contented horse and owner.